I was expecting Bijan’s memoir to focus more directly on her mother based on the title. There was definitely a strong thread about her parents and their life in Iran and attempts to adjust to life in America. 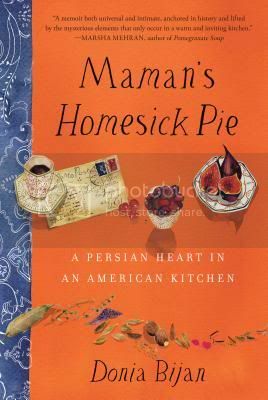 However, more than anything, Maman’s Homesick Pie is about Bijan herself, how she came to create her unique blend of Persian, American, and French food. Despite Maman’s Homesick Pie not being what I expected, it was still a lovely, heartfelt memoir. It is a slim tome, so Bijan does not always go into great depth of detail about people, places, or events, but what she does write is so evocative, that the sparseness of some of the details doesn’t really matter. Foodies and those who love stories about identity will greatly enjoy Maman’s Homesick Pie. Please also see the additional post with the giveaway and knife skills video. 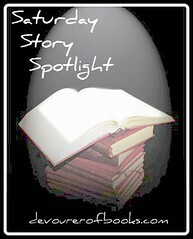 Kathleen Flinn is a Le Cordon Bleu-trained chef, but she wasn’t really doing anything much with her training. Sure, she wrote a book about her experience there, but since then? Yeah, not much for some time. Not until the Kitchen Counter Cooking School. It all started with a trip to the grocery store. Compelled by something she herself couldn’t quite explain, Kathleen approached a perfect stranger and began asking her about the piles and piles of boxes in her shopping cart, things that approximated, but didn’t approach, real food. When she discovered that the woman simply had no idea how to actually cook for herself the relatively easy dishes the boxes allegedly contained, an idea began to take root. This loss of literacy has roughly corresponded with our growing obesity epidemic, and the two do seem to be connected. This situation, Kathleen decided, was something that needed to change, even if only one person at a time. With help from fellow chefs, she chose nine women who wanted to change their eating and cooking habits and brought them to a basic kitchen and cooking class, covering not only specific methods of food preparation, but things like knife skills as well. If far too many of your meals come from a box, a bag, or a drive-through line and you wish they didn’t, this is the book for you. Flinn has a way of talking about cooking and food that is at once magical and realistic. Her instructions are clear and concise, and there is something new to learn on nearly every page. As a result, The Kitchen Counter Cooking School is hugely inspiring, making real home-cooking seem like something attainable. The best thing is, Flinn seems to truly believe in the abilities of not only everyone in her class, but everyone reading her book. There have been books before that have inspired me to want to change my eating habits; most notably, anything by Michael Pollan. These tend to be only very short-term changes, however, because while they often have concrete ideas of what to change, they fail to impart the tools for how to do it. That is where The Kitchen Counter Cooking School really excels. This is decidedly not a cookbook, but you will find a number of clear recipes, many of which I have already made within a week of reading the book. 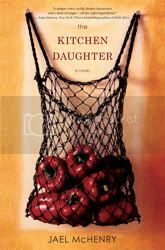 Although I may need to do rereads for further inspiration – The Kitchen Counter Cooking School has definitely earned a place in my permanent collection – I can see this as being the one that really sticks. For the aspiring home cook, The Kitchen Counter Cooking School provides both something to aspire to, and the tools to reach it. Highly recommended. In 1977, Camille Bergeron fled New Orleans and her abusive husband with her daughters Dahlia and Josie. A Creole woman willing to work a little voodoo didn’t exactly go over well on Little Gale Island in Maine, but the Bergeron women made it work for themselves, made at least some of the inhabitants of the town love them – enough to bring them into the fold a bit, as well as to get them into trouble. Now, in 2002, their pasts have caught up to them and suddenly their father is dead and the man they always thought of as their father is in a fight for his life. Dahlia and Josie are rich, complex characters who lead very interesting lives as fish out of water in Maine. They are mostly accepted by townspeople, but truly welcomed by very few, even after having lived on Little Gale Island for 25 years. Marks draws them realistically, especially considering that their present selves are only the stars of half of the book, since the other half deals with the time from when Camille met her husband up through the girls’ lives in Maine. In addition to having wonderful characters, the plot of Little Gale Gumbo pulls the reader right along, trying to figure out what really happened between the two men, as well as what might still happen for the sisters and their love interests. A quick and satisfying read. Recommended. 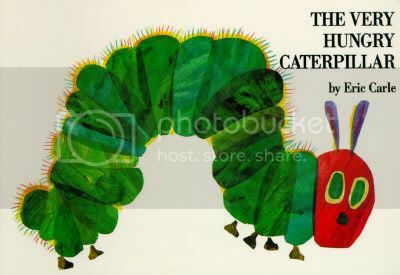 If there is any children’s author who gives Dr. Seuss a run for his money in the fame department, it is Eric Carle, and if there is just one book that Eric Carle is known for, it is The Very Hungry Caterpillar. After the tiny caterpillar hatches from his egg he is ravenously hungry, eating more and more each day, until he eats a ridiculous amount of food and gets a stomach ache. Soon enough, he eats a nice green leaf, creates a cocoon and, voila, butterfly! We are big fans of Eric Carle in this house, and The Very Hungry Caterpillar in particular. In fact, Daniel’s whole room is decorated in Very Hungry Caterpillar fabric, put together by his fabulous Nana. We actually hadn’t read this book for awhile, but I was really glad that I pulled it back out. Daniel is really into counting right now, and he had absolutely the very best time counting all of the foods that the caterpillar was eating. That is part of what makes The Very Hungry Caterpillar so timeless: no matter what developmental level, there is something in it for pretty much any young kid.